Sangeet Bai always had a fascination for bikes and cars since her childhood. This is one of the reasons she wants to work in a car or bike showroom. She belongs to a simple family in rural Chhattisgarh and no one in her family has ever been in a job. She is undergoing training as a showroom hostess at the Livelihood College in Jashpur and she is excited about a bright future. Sangeeta had learnt about the Livelihood College in her village and she saw it as an opportunity to fulfill her dreams of being independent. “I always wanted to do something on my own. I wanted to be independent and I thought getting a job would help me fulfill my dreams. I have always loved cars and bikes and that’s why I thought I would like to work in a car or bike showroom. My dream is to work in such a showroom and that is the reason I took up the course of Showroom Hostess at the Livelihood College.” She says. Sangeeta has gained a lot of confidence after doing this course and she is ready to face the big world outside her comfort zone. “Earlier I was hesitant while talking to people. But after doing this course I have learnt to talk in public. I have also gained a lot of confidence and I think I can fulfill my dreams.” She says. Sangeeta’s love for cars and bikes are not limited to working in a car or bike showroom only. “I want to learn driving and also to ride bikes. I just want to be independent.” She adds. Sangeeta’s father is a farmer and his income is somehow enough to meet the expenses of the six member family. But Sangeeta wants to contribute more to the family. 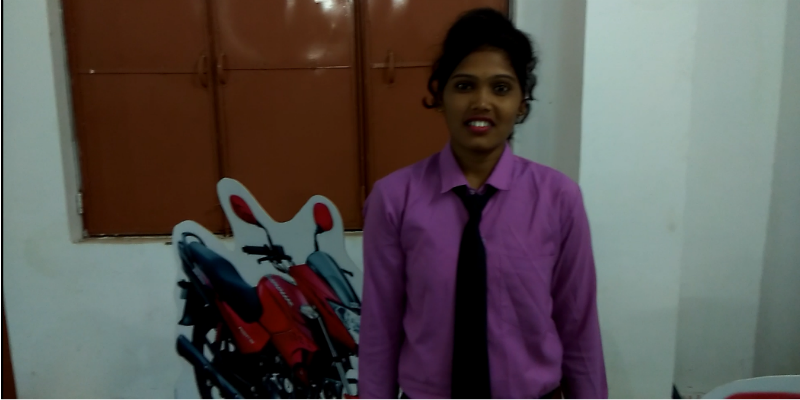 All the seniors in her course have landed in jobs and she is also confident of getting a job after completion of the course. The Showroom Hostess course is one of the most important and most popular courses in the Livelihood College Jashpur. Young boys and girls from various places come here to do this and other courses. The Livelihood College not only provides training to these youths but also provides placement support. The college is fully residential and the students are also provided with free study materials. The industry specific training in various courses are often supported by various corporate entities to ensure maximum placement of the students. Sangeeta is an example how the youths in Chhattisgarh are gearing up for a better future today by acquiring the skills required for various industries. These youths are the future of the state that is aiming to become one of the major hubs of skilled manpower for India and abroad. The government of India has already given a lot of emphasis on skill development. The initiatives like Skill India aims at turning India into a global manpower supplier. The Chhattisgarh government’s initiative of setting up the Livelihood Colleges are well in tune with this initiative.